GCAC Presents: Caravaggio. The Man. The Mystery. The Masterpiece. Some paintings find their power in the stories they tell, others in the stories that are told about them. Caravaggio’s Ecce Homo (Behold the Man), on view exclusively at the Columbus Museum of Art, does both. Michelangelo Merisi da Caravaggio painted, partied and brawled his way into art history. His “larger than life” reputation at times eclipsed his artistic legacy, however, his use of ordinary people as his models, heightened realism and theatrical lighting revolutionized the art world and continues to impact artists today. Michelangelo Merisi da Caravaggio, called Caravaggio. Italian, 1571 – 1610. Ecce Homo (Behold the Man), around 1605 Oil on canvas. 50-3/8 x 40-1/2 inches (128 x 103 cm). Musei di Strada Nuova -- Palazzo Bianco, Genoa. © Archivio Fotografico del Centro di Documentazione per la Storia, l’Arte e l’Immagine di Genova. Ecce Homo, the focal point of CMA’s exhibition Caravaggio: Behold the Man! The Impact of a Revolutionary Realist, is as shrouded in mystery as the man himself. The painting, depicting the moment that Pilate presents Christ to the people declaring, “Behold the man,” captures this moment with incredible poignancy. The painting’s history only makes the work more intriguing. Historically, an Ecce Homo by Caravaggio first was mentioned in the 1620s by a nephew of Caravaggio’s contemporary, painter Lodovico Cardi. 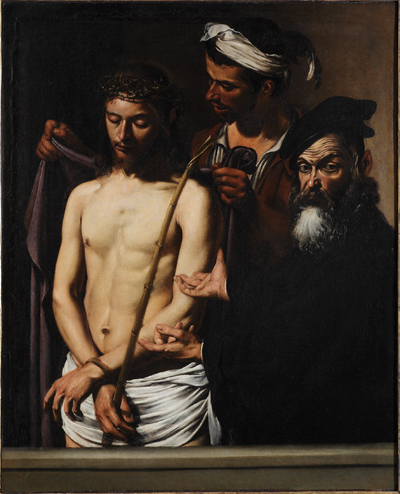 According to this account, a prominent Roman, Massimo Massimi, had held a blind competition where Caravaggio, Cigoli, and Domenico Passignano, were to paint an ecce homo. When Massimi chose Cigoli’s painting as winner, he gave away the other two. The painting was discovered in the stairway of the badly-bombed Royal Naval Academy, in Genoa Italy, where it had hung since the 1920s, and was taken back to the storerooms of Genoa’s Palazzo Bianco Museum, catalogued as a copy by one of Caravaggio’s followers. During World War II, the painting was badly damaged and stored in Genoa’s Palazzo Ducale until 1953, when the director of the Genoese museums thought it might be an original by Caravaggio. This was confirmed by the eminent art historian Roberto Longhi, a Caravaggio scholar. Longhi also believed the figure of Pilate to be a highly caricaturized self-portrait. 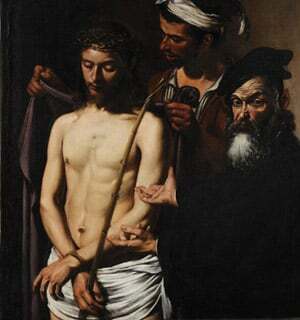 This would not be unusual as Caravaggio included his likeness in many of his works. A rare document from Caravaggio, dated June 25, 1605, states that he agreed to paint another religious work for Signore Massimi to match a Crowning with Thorns he had already made for him; this likely would have been an ecce homo. This note, dated just weeks before Caravaggio stabbed a man and fled to Genoa, suggests that he may have taken the painting with him and finished it there. This powerful painting will be the centerpiece of an exclusive exhibition organized by CMA on view October 21, 2011 – February 5, 2012. CMA and the Museum Store are open Tuesday through Sunday from 10:00 am to 5:30 pm, and until 8:30 pm every Thursday. The Palette Express is open Tuesday through Sunday from 10:00 am to 3:00 pm. Admission for Caravaggio is $10 for adults; $8 for seniors and students 6 and older; and free for members, children 5 and younger. On Sundays, admission is $5 for adults and seniors, free for children 17 and under with a paying adult. For additional information, visit www.columbusmuseum.org.